THE first revival of the Silk Road—a vast and ancient network of trade routes linking China’s merchants with those of Central Asia, the Middle East, Africa and Europe—took place in the seventh century, after war had made it unusable for hundreds of years. Xi Jinping, China’s president, looks back on that era as a golden age, a time of Pax Sinica, when Chinese luxuries were coveted across the globe and the Silk Road was a conduit for diplomacy and economic expansion. The term itself was coined by a German geographer in the 19th century, but China has adopted it with relish. Mr Xi wants a revival of the Silk Road and the glory that went with it. This time cranes and construction crews are replacing caravans and camels. In April a Chinese shipping company, Cosco, took a 67% stake in Greece’s second-largest port, Piraeus, from which Chinese firms are building a high-speed rail network linking the city to Hungary and eventually Germany. In July work is due to start on the third stage of a Chinese-designed nuclear reactor in Pakistan, where China recently announced it would finance a big new highway and put $2 billion into a coal mine in the Thar desert. In the first five months of this year, more than half of China’s contracts overseas were signed with nations along the Silk Road—a first in the country’s modern history. Politicians have been almost as busy in the builders’ wake. In June Mr Xi visited Serbia and Poland, scattering projects along the way, before heading to Uzbekistan. Last week Russia’s president, Vladimir Putin, made a brief visit to Beijing; he, Mr Xi and Mongolia’s leader promised to link their infrastructure plans with the new Silk Road. At the time, finance ministers from almost 60 countries were holding the first annual meeting in Beijing of an institution set up to finance some of these projects, the Asian Infrastructure Investment Bank (AIIB). Like a steam train pulling noisily out of a station, China’s biggest foreign-economic policy is slowly gathering speed. Chinese officials call that policy “One Belt, One Road”, though they often eviscerate its exotic appeal to foreigners by using the unlovely acronym OBOR. Confusingly, the road refers to ancient maritime routes between China and Europe, while the belt describes the Silk Road’s better-known trails overland (see map). OBOR puzzles many Western policymakers because it is amorphous—it has no official list of member countries, though the rough count is 60—and because most of the projects that sport the label would probably have been built anyway. But OBOR matters for three big reasons. First, the projects are vast. Official figures say there are 900 deals under way, worth $890 billion, such as a gas pipeline from the Bay of Bengal through Myanmar to south-west China and a rail link between Beijing and Duisburg, a transport hub in Germany. China says it will invest a cumulative $4 trillion in OBOR countries, though it does not say by when. Its officials tetchily reject comparison with the Marshall Plan which, they say, was a means of rewarding America’s friends and excluding its enemies after the second world war. OBOR, they boast, is open to all. But, for what it is worth, the Marshall Plan amounted to $130 billion in current dollars. Next, OBOR matters because it is important to Mr Xi. In 2014 the foreign minister, Wang Yi, singled out OBOR as the most important feature of the president’s foreign policy. 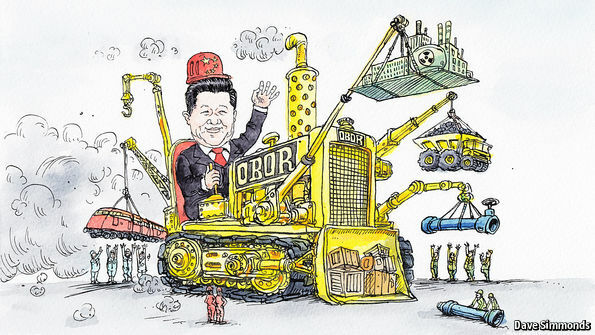 Mr Xi’s chief foreign adviser, Yang Jiechi, has tied OBOR to China’s much-touted aims of becoming a “moderately well-off society” by 2020 and a “strong, prosperous” one by mid-century. 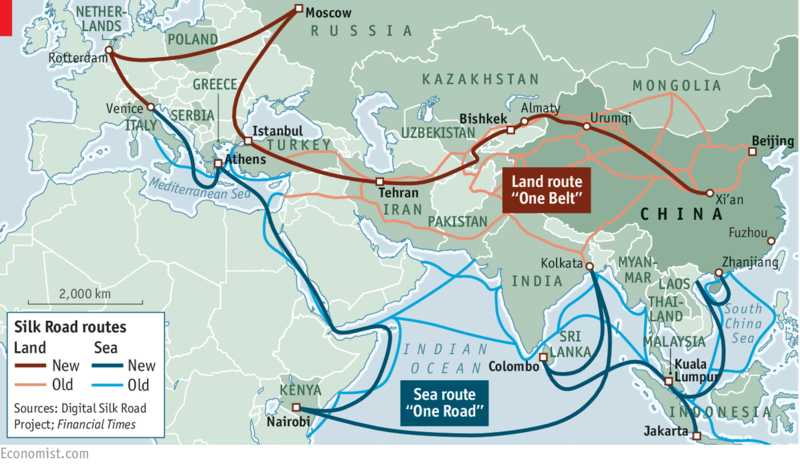 Mr Xi seems to see the new Silk Road as a way of extending China’s commercial tentacles and soft power. It also plays a role in his broader foreign-policy thinking. The president has endorsed his predecessors’ view that China faces a “period of strategic opportunity” up to 2020, meaning it can take advantage of a mostly benign security environment to achieve its aim of strengthening its global power without causing conflict. OBOR, officials believe, is a good way of packaging such a strategy. It also fits with Mr Xi’s “Chinese dream” of recreating a great past. It is not too much to say that he expects to be judged as a leader partly on how well he fulfils OBOR’s goals. Third, OBOR matters because it is a challenge to the United States and its traditional way of thinking about world trade. In that view, there are two main trading blocs, the trans-Atlantic one and the trans-Pacific one, with Europe in the first, Asia in the second and America the focal point of each. Two proposed regional trade deals, the Trans-Pacific Partnership and the Transatlantic Trade and Investment Partnership, embody this approach. But OBOR treats Asia and Europe as a single space, and China, not the United States, is its focal point.